Your building’s timber frame will be made from a series of panels, which we manufacture in our workshop in Appleby, Cumbria. Each panel is made from five main components, individually chosen for their quality and performance. All the materials we use are either made in the UK, reducing the environmental impact of transportation, or sourced from UK suppliers, supporting local businesses. Two other important components are special airtightness tapes and adhesive. You’ll find more details about each of the components below. We connect I-beams to create the core of the frame, typically spaced at 600mm centres. Battens are attached to the interior vapour-barrier board, creating the service cavity for your plumbing pipes and electrics. Later on, your plasterer will affix plasterboard to these. At the heart of our panel system is a frame made from engineered I-beams. 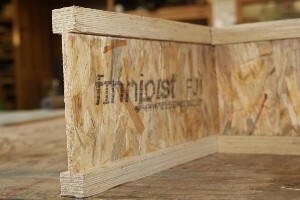 We currently use the Finnjoist I-beam, made by Metsä Wood at their King’s Lynn plant in the UK. These I-beams are manufactured from high-quality, oriented-strand board (OSB3) web, and flanges made from the company’s own Kerto laminated veneer lumber. The Finnjoist engineered timber i-beam joists deliver strength and rigidity. The Kerto used for the flanges is incredibly strong and stable, and it does not distort or shrink. The end product is an I-beam that’s lightweight yet incredibly strong and reliable. Fully engineered and factory produced to give uniform strength, rigidity, size and weight, it outperforms traditional solid wood construction. Metsä Wood is part of Metsä Group, a unique Finnish co-operative comprising some 123,000 forest owners with 5.2 million hectares of forest land under its control (about 46% of all private forests in Finland) and 13,000 employees globally across 20 countries. Visit the Metsä Wood website to learn more about the company and its products. The factory also fulfils the obligations of European Union Regulation No. 995/2010 (EU Timber Regulation), which prohibits the placing and trading of illegally harvested timber and timber products on the market. As all wood raw material is covered by PEFC Chain of Custody certification, Metsä Wood knows the origin of all the wood it uses. On the outside of your timber panels, we put on a weatherproof shell. Picture it as your building’s Gore-tex jacket. It’s a breathable membrane that offers weather protection during construction, while also acting as part of the frame’s ongoing moisture control system. The membrane we typically use is called Solitex Fronta Humida. It’s manufactured by Pro Clima, a German company whose materials are at the forefront of Passivhaus construction. 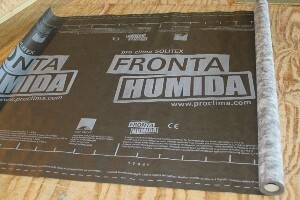 Backed by Pro Clima’s excellent reputation for quality products that perform to the highest standards, Fronta Humida protects your frame from moisture coming in from outside, while also allowing any moisture introduced during the building phase to dry out. Our supplier is Ecological Buildings Systems, the sole UK importer for Pro Clima products. They’re based near us in Cumbria. Visit their website for full details about their range of products for energy-efficient building. Beneath the Fronta Humida exterior shell comes a layer of Gutex wood fibreboard. This is an insulated board, which is permeable by water vapour to allow moisture to pass out from your building. It’s part of the system that regulates humidity in your energy-efficient home. Gutex is a German company, based in the Black Forest. With an 80-year history, the firm is a leader in innovative, environment-friendly manufacturing. Gutex is well respected in the world of energy-efficient construction, due to the quality and performance of its products. All Gutex products undergo stringent quality control tests by the company and are subject to approval by an independent, authorised test and certification agency (FMPA, Stuttgart). We source our Gutex boards from Cumbria-based Ecological Building Systems. There’s more information about Gutex boards on the Ecological Building Systems website. Gutex insulation boards are manufactured from raw material obtained from forests in the Black Forest, where only sustained forestry practices are employed. The company’s quality and environmental protection management system is certified according to DIN EN ISO 9001, ISO 14001 AND EMAS 11 (EU Eco Audit Ordinance). 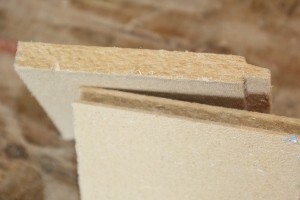 On the inside of your building, your timber panels will have an interior vapour-barrier board. 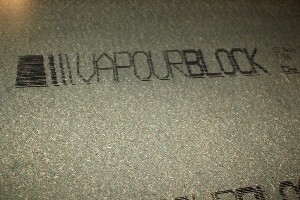 We generally use Spano Durelis VapourBlock, made by Unilin. It’s a high-density chipboard with a factory-fitted transparent layer called Topfinish, which guarantees consistent airtightness and vapour control. Topfinish also eliminates the requirement for additional vapour-control membranes on the internal side. This structural board is the main component that makes your building airtight, which is the key to reducing the amount of energy you’ll use for heating. Research by the Building Physics Laboratory at the K.U. 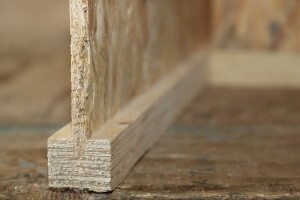 Leuven and on-site experience showed that traditional OSB boards are not always airtight. In response, Spanotech developed the technical board VapourBlock, which specifically addresses this, providing a consistent airtight layer to the highest industrial standards. The board is CE marked and manufactured to the highest quality standards to comply with ISO 9001. We source our Durelis VapourBlock from Ecological Building Systems, based near Carlisle in Cumbria. You’ll find more information about it on their website. Once the interior and exterior boards are in place and sealed, we fill the panel with insulation. The product we typically use is Warmcel. Made entirely from recycled newsprint, Warmcel is a high-performance cellulose fibre insulation offering very high U-values. We inject Warmcel into our panels to a specific high density, so that no settling occurs when the panels are erected upright. For the life of your building, your panels offer a complete, reliable insulation layer. 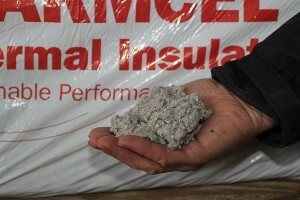 In every way, Warmcel is an eco-friendly and highly effective insulation. By taking waste paper and recycling it, Warmcel sequesters thousands of tonnes of carbon that would otherwise be released as methane gas at landfill. It has an incredible degree of fire resistance and offers effective acoustic insulation, too. The company is based in the UK and its insulation is used around the globe. Visit the Warmcel website to find out more. We use only the best tapes and adhesive available on the market to ensure our panels are fully sealed. We pay the highest attention to detail when sealing our panels, because it’s absolutely critical to our airtightness and vapour-control system. The products we use are from Pro Clima, the German company that manufactures some of the other airtightness and vapour-control products we use. We use two types of tapes: Tescon Vana for the interior side of the panels, and Tescon Invis for the exterior. 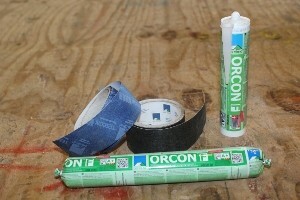 We also use Orcon F adhesive sealant (the stickiest, strongest stuff we’ve ever come across!). We source these from Ecological Building Systems in Cumbria.